"Brun Hafker, 79, head of the Hafkel [sic] Iron Works, 73 North Portland Avenue, Brooklyn, died Oct 16 of arterio sclerosis at his home in Brooklyn." This brief notice in Iron Age, 20 Nov. 1919, pg. 15, announced the death of Bryan Hafker (1840-1919), founder of the Hafker Iron Works. 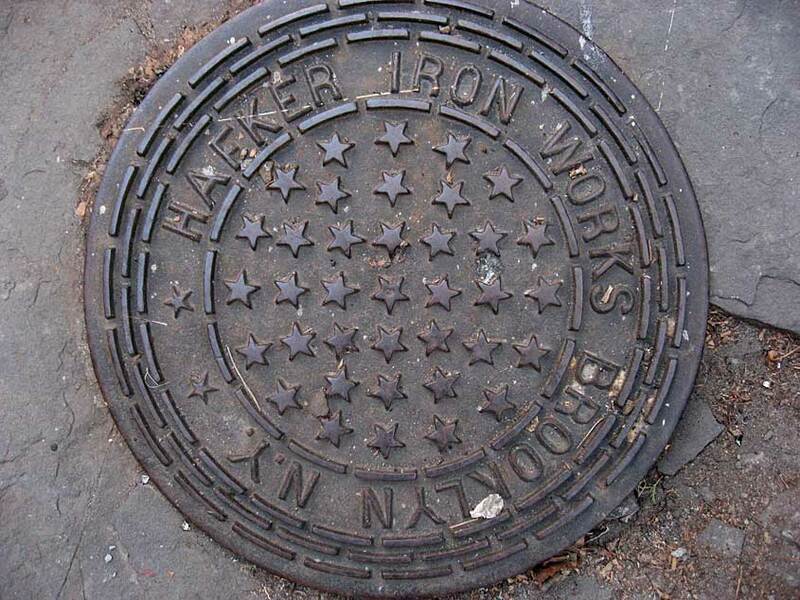 The Hafker Iron Works were located at 73 N. Portland Ave., Brooklyn, from 1891 to 1940. Prior to 1891 the foundry was located across the street at 72 N. Portland Ave. from 1875. The early Hafker listings give his profession as blacksmith, horseshoer, awning frames and iron railings. His first name is variously spelled Brian, Brien, Bryan, Bruen, Bruinn, Brun, Brum and even Bruce! Brunn Hafker's naturalization petition dated 11 May 1900 stated that he was 59 years old, a blacksmith, living at 71 Portland Ave., Brooklyn, and that he arrived in the U. S. through the port of New York 15 May 1880. This arrival date is probably incorrect. The Hafker family was recorded in the 1880 U. S. Census living at 74 N. Portland Ave., Brooklyn. Bryen Hafker was set down as 39 years old, blacksmith, born Prussia. He lived with his wife, Maggie, 32, also born Prussia. The couple had three children, all born in New York. The oldest was Annie, age 7. The 1900 U. S. Census indicates that he immigrated in 1860, and that his oldest child, Annie, was born Nov. 1872 in New York. On Bryan Hafker's death in 1919, the foundry continued under his sons, John Frederick Hafker (1877-?) and Edward Harry Hafker (1880-1974). Both men registered for the World War I draft in 1918 when they were iron workers at B. Hafker Iron Works, 73 N. Portland Ave., Brooklyn. Another son, George William Hafker (1887-1974), also worked in the business. He registered for the World War I draft in 1917 when he was employed as a "chauffeur" (probably means he drove the company truck) at B. Hafker, 73 N. Portland Ave., Brooklyn. In 1943 George William Hafker, age 57, was listed on the ship's manifest of the S. S. West Point, sailing from Massava, Eritrea, 6 April 1943, and arriving in the port of New York 4 May 1943. What was this all about??? The Hafker Iron Works seem to have stayed in business on N. Portland Ave. until around 1940. The Brooklyn telephone directory listed them nearby at 471 Clermont Ave. in 1941 and 1942.